The Navajo Nation Reservation in the Southwest U.S. is home to 300,000+ Native American residents and covers more than 27,425 square miles. 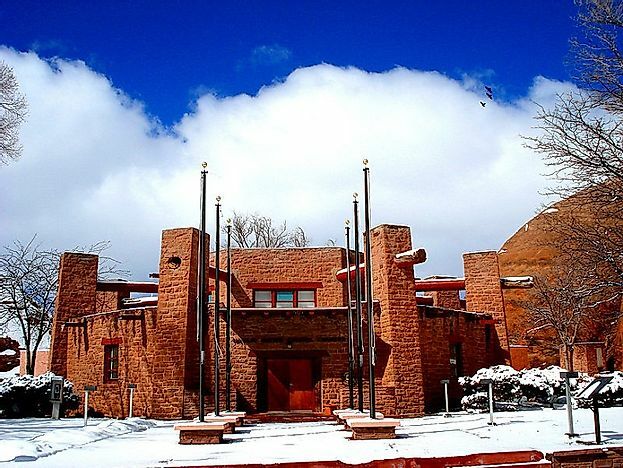 The Navajo Nation Council Chambers in the city of Window Rock, Arizona (known as Tségháhoodzání in Navajo), the seat of government of the Navajo Nation. Native American reservations are located within the US and are managed by the tribe that they belong to under the US Bureau of Indian Affairs. Tribal members living on these lands exercise a certain degree of sovereignty, led by the tribal council, and may have different laws than surrounding areas. Designating these reservations to Native American groups came after years of forced removal and assimilation efforts by colonizers. Below is some information regarding the largest reservations in the US. The Navajo Nation reservation is spread out over parts of the three states of Arizona, New Mexico, and Utah. It is the largest reservation in the country with 27,425square miles that 173,667 people call home. This area was designated after the signing of the 1868 Navajo Treaty with the US government. The government here was established during the 1920’s after oil was discovered and oil companies wanted to explore the deposits. Today, they have reorganized into 3 branches, namely the executive, judicial, and legislative. The Navajo governance system is considered one of the most organized. The Uintah and Ouray Reservation is found in the northeastern portion of Utah. It is the second largest reservation in the United States after the Navajo nation, with 6,825.13 square miles covered. The Ute tribe is divided into three bands: the Uintah Band, the Uncompahgre Band, and the Whiteriver Band. The Ute language is wildly spoken on the reservation and further afield. The Tohono O'odham Nation Reservation belongs the the Tohono O'odham people. It is located on 4,453.83 square miles in Arizona. Aside from around 10,201 people, the reservation is also home to a number of astronomical sites such as the famous Kitt Peak National Observatory. The majority of the Tohono O'odham people live off-reservation. The Pine Ridge Reservation is a 4,353.80 square mile reservation found in Nebraska and South Dakota. The reservation is governed by the Oglala Sioux Tribal Council. Pine Ridge is famous for having been the site of the Wounded Knee Massacre, in which some 150-300 Lakota people, including men, women, and children, were brutally murdered by the United States army. The Cheyenne River Reservation formerly belonged to the Great Sioux Reservation. The 4,419 sq mi reservation is located adjacent to the Standing Rock Indian Reservation. Today, life on many reservations has been compared to the developing world. Common health issues include malnutrition, diabetes, high infant mortality, and alcoholism. All of these are driven by the rampant poverty and lack of economic opportunities available on tribal lands. These are indicators of a much more complicated problem rooted in structural violence. The US Bureau of Indian Affairs, set with the responsibility of managing tribal affairs to their benefit, has been criticized with having done everything but that. Often times, the mismanagement of assets and land ownership issues, and complicated environmental and economic regulations, have worked to discourage new development and investments.